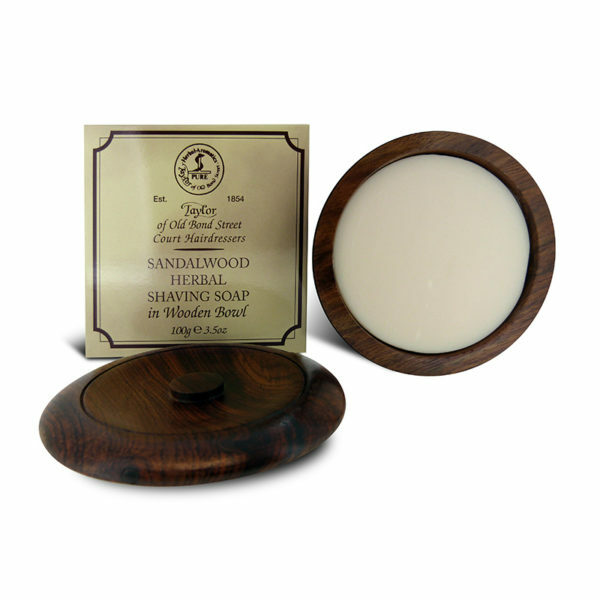 The exclusive Shaving Soap with its elegant wooden bowl belongs to the real classics of the English traditional company and makes for a perfect foam. The unique and intense sandalwood scent of Taylor of Old Bond Street is an absolute bestseller and can be counted as a favorite among many customers. The sandalwood shaving soap of Taylor of Old Bond Street is the ideal prerequisite for a thorough wet shave. The balanced formula of the glycerin-based shaving soap allows for a voluminous foam, the mixture is gentle to the skin and keeps it hydrated. The blade can thereby glide perfectly, making for a gentle and smooth skin sensation. Supplementing the classic sandal wood shaving soap in the wooden jar, Taylor of Old Bond Street offers the suitable shaving line in the sandalwood scent-variation. 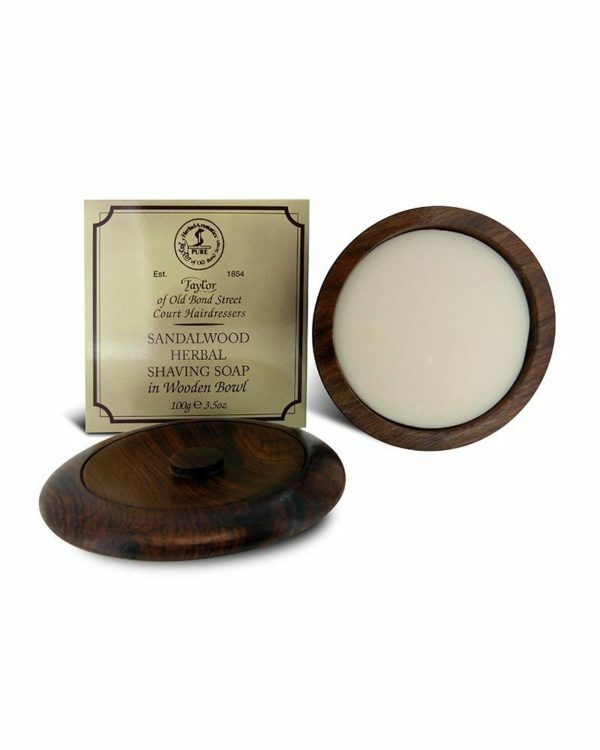 The sandalwood shaving cream in the jar or in the tube; The sandalwood aftershave lotion such as the especially light sandalwood aftershave gel. All products of Taylor Old Bond Street reflect the philosophy of the British company: The high appreciation of traditional knowledge over selected essences, ingredients and aromas, which Taylor of Old Bond Street has united over generations and thereby creating unique scents and best shaving- and body care products. The classic masculine scent sandalwood of Taylor of Old Bond Street is a successful combination of woods, blossoms and herbs. The spicy sandalwood and the peppery cedarwood find their harmony with light lavender and strong rosemary. A fine hint of jasmine and rose are the icing of the cake of the selected perfume. Sandalwood – the absolute bestseller of Taylor of Old Bond Street – stands out for its overwhelming, masculine note. Foam the shaving soap with a wet shaving brush in the bowl. Wet your face with some warm water. Now distribute the rich foam on the to-be shaved areas. Enjoy a pleasant, thorough shave. After the shave, wash off the any residues with some warm water.